Given his occasionally fratboy-like tendencies, it stands to reason that Post Malone is no stranger to the 3AM BBQ session. Plus, as HaHa Davis might say, Posty is certainly a big fella. Therefore, it's no wonder that the Beerbongs & Bentleys rapper absolutely showed out at Whalburger's, which you might recognize as Mark Whalberg's Boston based restaurant. Perhaps it was the acclaimed food that drew Posty to the burger spot, or perhaps simply a desire to meet Marky Mark, either way, fate brought him where he needed to be. 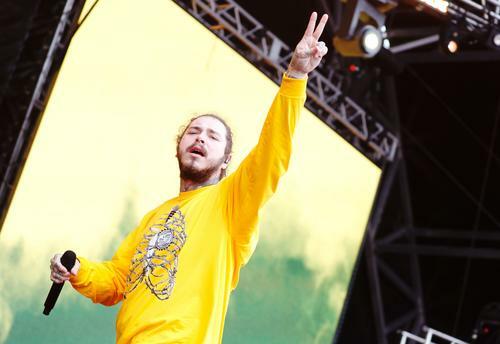 Mark Whalberg took to Instagram to share a memory of Post's experience, which includes dining on basically a table full of meat. One has to wonder if Post is abiding by the Noah's Ark meal plan, which is to say, two of every animal. Either way, he'll likely play the "I'm a growing boy" card if pressed. Jokes aside, Mark Whalberg came through to oversee Post's dining experience. It's always interesting to see actors and musicians interact, being forced to stifle their star-struck nature. Still the respect was evident, as Mark sat down to chop it up with the young talent. While it's doubtful that we'll see a Marky Mark and the Funky Bunch reunion anytime soon, it wouldn't be surprising if Mark went home that night and cued up some of his old-school hits.